There are not many brands that can boast having been going for 70 years. One that can is Britannia, the range of wash systems from Smith Bros & Webb. The renowned vehicle wash manufacturer has achieved three score years and ten with this brand and is not only surviving, but thriving. Chris Peat met Sales and Marketing Manager, Simon Tipple, at the company’s Alcester headquarters to see how the business is getting on in this milestone year. Though it has reached the venerable age of 70, the company is far from slowing down and taking things easy. Instead it is exerting a fresh flush of energy, rejuvenating itself in the last two to three years with an overhaul of its internal organisation. This has included creating a new role to advance its marketing, a position filled by Simon. Despite falling into some difficult times during the recession, the business decided to ‘push on’, in Simon’s words, through this tough period and this has evidently paid off. According to Simon, orders have been pouring into the company for its Britannia brand of bus, coach and CV washing machines. Customers have been coming in from not only across the UK but throughout the world, including a recent one from Hong Kong. In this country, the launch of new vehicles, including the New Routemaster, has helped fill the order book. A major boost has been over £2.5m coming in from overseas railway networks that are expanding to meet customer demand. Such is this order upsurge that turnover is expected to double this year compared to 2013’s figures. Simon said Smith Bros & Webb is taking advantage of the surge in business to ‘push on’ with plans to advance, saying, ‘Whilst the sun shines, make hay’. The focus of the company’s efforts will be on promoting the brand to customers and potential customers. He said the business is already well recognised, both overseas and on these shores, but an extra boost is always welcome. Simon is concentrating on the perception of the Britannia name from the customer’s point of view. One way it is doing this is by launching a new website (www.sbw-wash.com), which should be going live within the next few weeks. As well as focusing on the brand and marketing, Smith Bros & Webb is also developing a number of new products. For 2014, it is bringing out the new Chassismaster, a redesigned cold water chassis cleaning system. It is built to withstand arduous conditions and is suitable for cleaning under all types of PCVs. For rail applications, one major system being launched is its new airline-style controlled emissions toilet drop system designed to work three times faster than conventional models. It uses negative pressure to evacuate 800litres of effluent in eight seconds, allowing a single operative to clean out tanks on a 12 carriage high speed train in ten minutes. The task would have previously taken half an hour and the company believes it is the first of its kind in the world. Trains are just one of Smith Bros & Webb’s main markets, with the commercial vehicle sector another target industry. The PCV arm of its business makes up a significant amount of its trade, with some of the country’s largest operators among its customers. 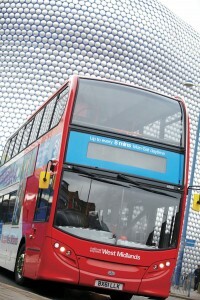 Its Streamline machine is a popular choice among bus and coach operators, according to Simon. 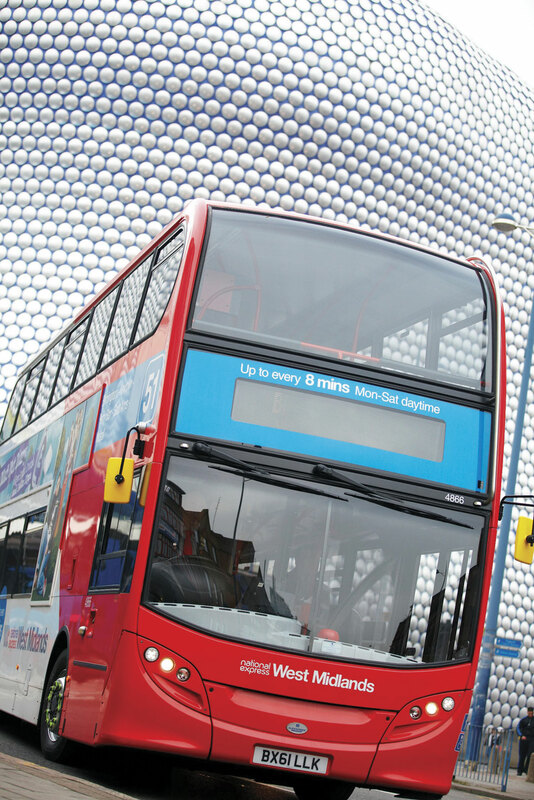 The four brush drive through system is designed to cope with 80 buses an hour and is suitable for everything from minibuses to double deckers. National Express West Midlands’ Walsall depot has recently had both a new and refurbished Streamline installed as well as two full water reclamation systems. According to the company’s brochures, the Streamline is easy to install in a depot. The same is said of its two brush drive through Britannia Supreme, which can wash up to 50 buses an hour. 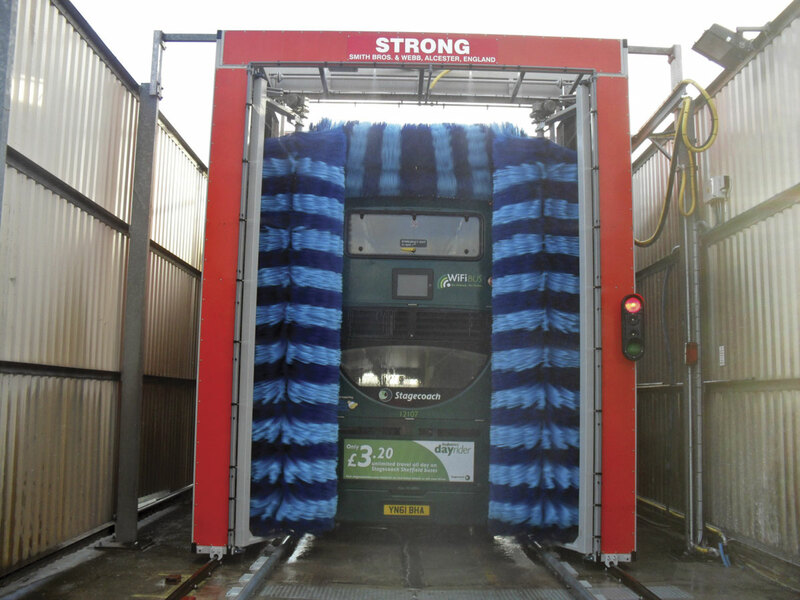 Another one of its products commonly installed is the three brush, gantry, drive-through Britannia Strong. It has a microprocessor controlled brush system, allowing it to cope with irregular shaped vehicles. Simon said this comes in handy with coaches sporting gull wing mirrors, ensuring the brushes move to place the correct pressure on the protrusions to ensure no damage is caused. The system can have an unlimited number of programme settings for different vehicles in the fleet. Smith Bros & Webb has its own cleaning fluids too, which it suggests for using with its washes. Simon said Smith Bros & Webb prides itself on specifying washes to customers’ requirements. The company will always do a full survey to assess what wash equipment would best suit the operation. Simon said the business will always listen to what its clients want, all part of ensuring they meet their requirement. A full range of water reclamation systems are also available including carbon and sand filter options, water softening equipment and RO (Reverse Osmosis) systems. Smith Bros & Webb provides full recycling systems, collecting water used in previous washes, filtering and cleaning it for another wash. It has systems that can be combined with all of the wash manufacturer’s products. Its systems recycle up to 90% of the water used in a wash. Using this equipment not only boosts green credentials and ensures legal compliance, it also helps save money. 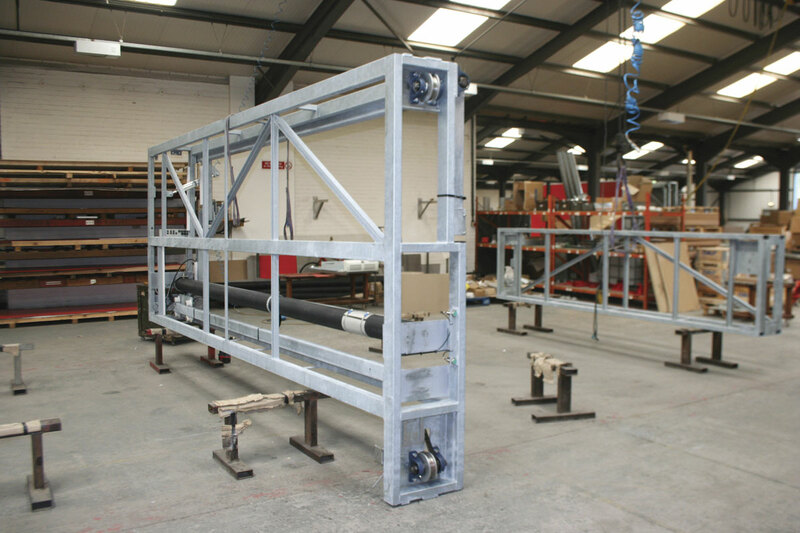 If a full reclamation system is installed, Simon estimates that you could have full pay back of the system within three years of purchasing it. Enhanced Capital Allowances (ECAs) enable a business to claim 100% first-year capital allowances in their spending on water conservation plant and machinery. Businesses can write off the whole of the capital cost of their investment in these technologies against their taxable profits of the period during which they make the investment. This can deliver a helpful cash flow boost and a shortened payback period. Rain water harvesting is another option that can be combined with Britannia equipment, something else that is not only environmentally friendly but also helps to cut down on water bills. Cardiff Bus is a recent customer for this equipment. Service contracts are available from Smith Bros & Webb, covering breakdowns and part replacements. Turnaround time when it comes to breakdown repair is within 24 hours. 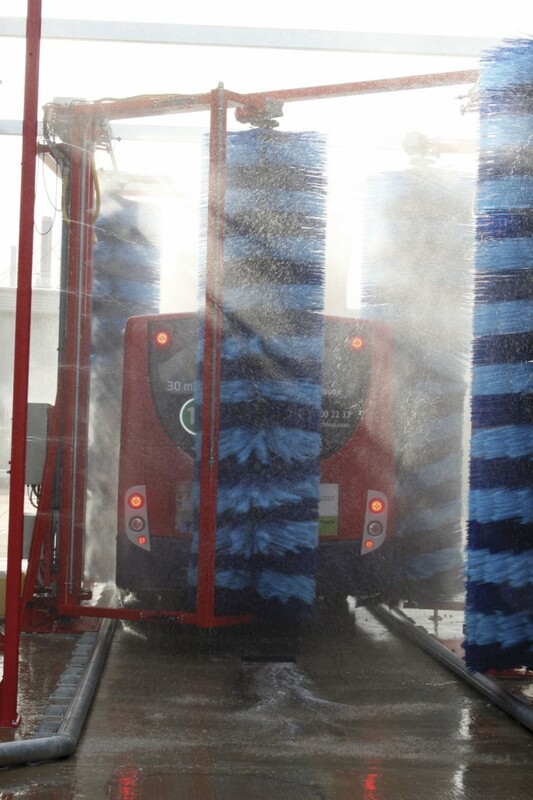 Simon said the company is well aware of the fact an operator cannot afford to have vehicles out of action because they cannot be cleaned for too long. This is especially the case when local authorities include vehicle cleanliness stipulations in service contracts. All its systems come with a warranty, the length of which depends on what system it is. Very popular these days are all inclusive contracts, which cover the machine for all breakdowns, parts and servicing. It is this focus on providing a quality service, as well as a reliable product line up, that has helped it achieve 70 years in business, according to Simon. Another factor is its specialisation in the transport and CV market. There are many competitors but Simon notes that some have only relatively recently come into the CV sector, while some that have been established for some time have focused on the car wash market and diversified into the truck and bus sector when times have got hard as an alternate revenue source. Smith Bros & Webb’s history actually goes back further than 70 years. Brothers William and Charles Smith (the company’s namesakes) set up a construction company in Birmingham in 1886. They later diversified into engineering. In 1923, their firm was credited with building what has been described as the first ever train wash in the UK. The Britannia brand was launched in 1944, expanding into supplying wash systems for the wider CV industry. 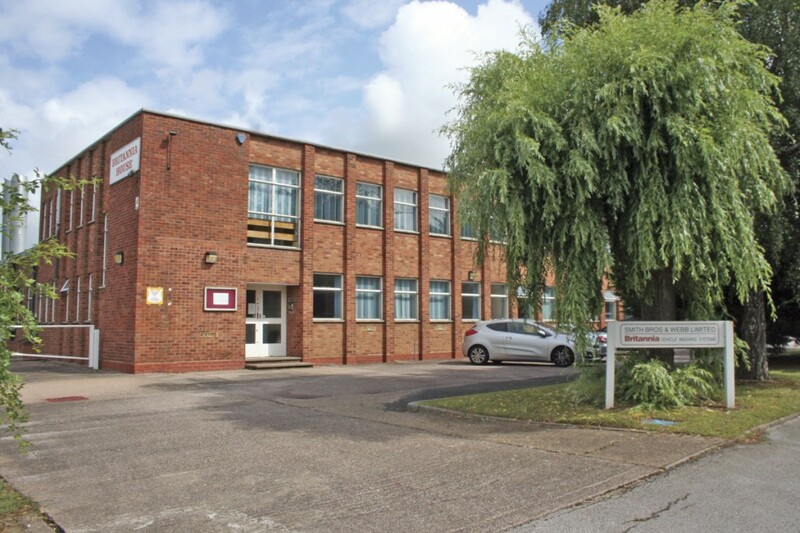 The family owned firm moved to Alcester in 1969 and its business flourished, selling to all corners of the globe. In response to this, a network of agents has been set up around the world. 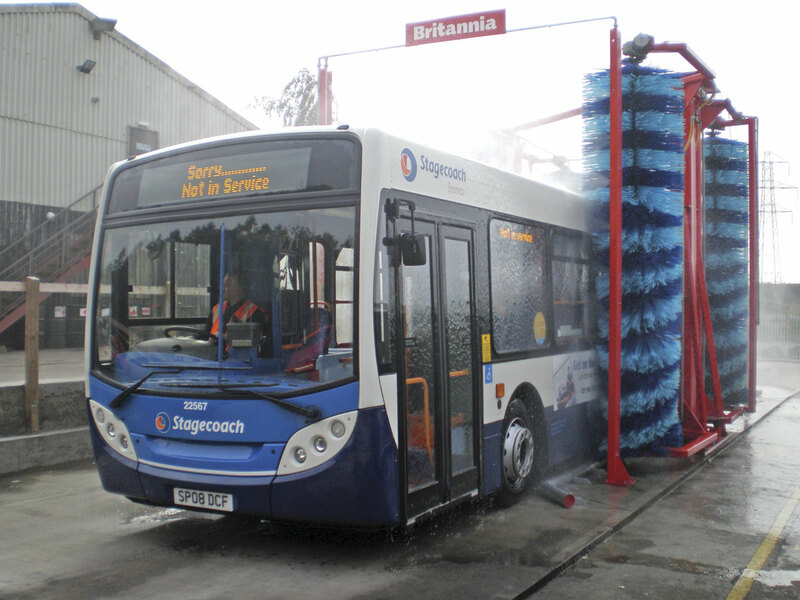 Over the years, Smith Bros & Webb has worked on further developing its washes’ reliability. 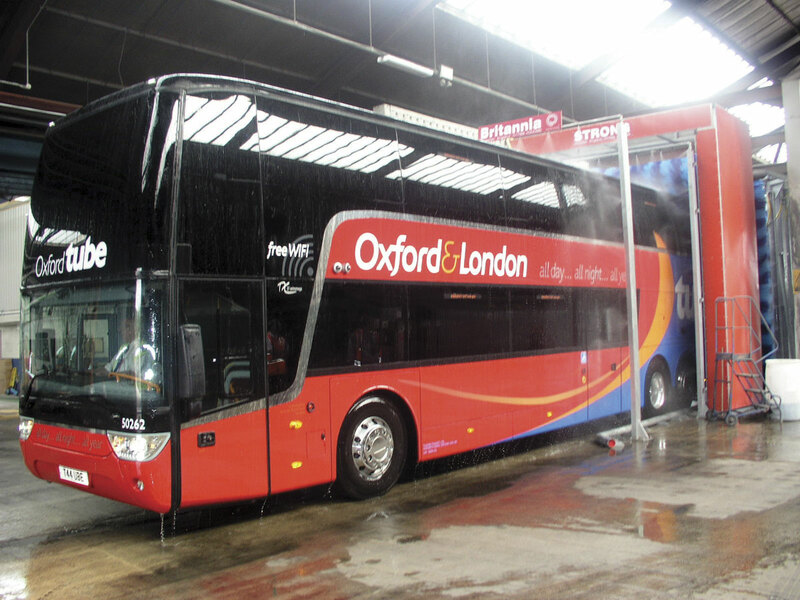 Its aim has been to achieve high throughput times for buses; getting as many through the wash as quickly as possible without compromising the machine’s cleaning quality. The reason it has focused on doing this is the increase in fleet sizes it has seen over the years. Water reclamation has become a more popular option during this time too, and it is anticipated that it will continue to be so. Looking to the future, things seem bright for Smith Bros & Webb, according to Simon. The company had a tough few years, but now with figures doubling and enquiries coming in regularly, combined with the new products coming out, ‘the future is looking very good’.